Count 'Em Up is a downloadable microgame in WarioWare: D.I.Y. and WarioWare: D.I.Y. Showcase, which was released on July 29, 2009 in Japan, June 28, 2010 in North America, and July 30, 2010 in Europe. The name of this microgame is a pun of the video game genre, the shoot 'em up. It returns in WarioWare Gold as one of Young Cricket and Master Mantis' microgames. At the start, there are three men on the ground, and, above them, the sign for this 'Push-Up Contest'. Then, they will randomly start doing push-ups. One will do one push-up, one will do two and one will do three - which man does how many is randomly chosen. Every time one of them goes down to the ground and back up is a push-up. At the end of the push-ups, arrows appear above each of the men, asking "Who did the most?" 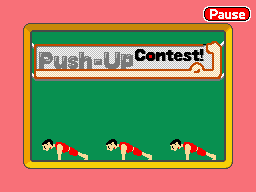 If the player taps the arrow of the man who did the most push-ups, the game will be won. A three and a crown will appear above the winner, then a two above the person in second place and a one above the player in last place. Plus, the winner will start doing lots of push-ups. If the player waits on the screen with the arrows too long, they will run out of time. If the player taps the arrow of the man who did two or one push-ups, the man who was chosen will fall to the ground and the game will be lost, not without the three, two, one and crown appearing. 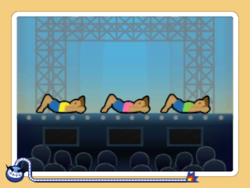 1st level difficulty: The player has to identify who performed 3 sit-ups. 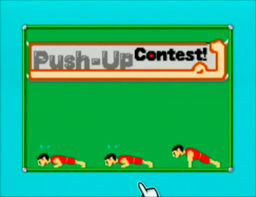 2nd level difficulty: The player has to identify who performed 3 push-ups, as in the original microgame. Some of the contestants will perform fake-outs. 3nd level difficulty: The player has to identify who performed 4 skips with the jumping rope. This page was last edited on February 11, 2019, at 15:08.